Spring is here and my thoughts have returned to all things Macaron. I wanted to play with the colours and flavours that remind me of Spring. 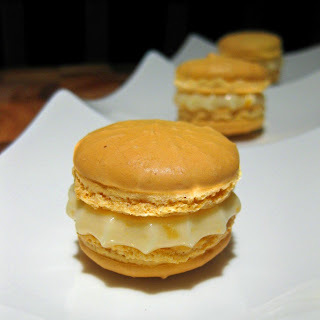 This macaron is a gorgeous pale yellow shell with a lovely peach and ginger cream filling. I can feel the sunshine just looking at them. Can't you? Enjoy! 1. In a stand mixer fitted with the whisk attachment, whip the egg whites to a foam, gradually add the sugar, vanilla, food colouring until you obtain a glossy meringue. Do not overbeat your meringue or it will be too dry. 2. Place the almonds and powdered sugarin a food processor and give them a good pulse until the nuts are finely ground. Sift the mixture and add it to the meringue, give it a quick fold to break some of the air and then fold the mass carefully until you obtain a batter that falls back on itself after counting to 10. 4. Fill a pastry bag with the batter and pipe small rounds (1.5 inches in diameter) onto parchment paper or silicone mats lined baking sheets. Preheat the oven to 350F. Let the macarons sit out for 30 minutes to an hour to harden their shells a bit and bake for 10-12 minutes, depending on their size. Let cool. 5. For the filling: Beat together softened butter and cream cheese until smooth. Add the jam and marmalade. Gradually beat in powdered sugar until you get the desire consistency. 6. To assemble the macarons, pipe or spoon some of the filling in the center of one shell and top with another one. These Macarons are part of this month's MacTweet round up in celebration of Macaron Day on March 20th. Go check out the other amazing Macarons! Those macarons are marvelous! I love that choice of flavors! so pretty and definitely spring-like! Your macarons are definitely spring-y! And what interesting choice of flavors -- sounds yummy! OH PRETTY PRETTY PRETTY! Yes, they are dragon's own, and I love the choice of fresh flavours! Very very nice! Wow, so sweet and pretty. Me thinks you're confidence in making macarons is full-on...glorious! You are amazing. They look perfect! What an interesting choice of flavoers! Those macarons look so delicious! What a lovely spring treat - your macarons look perfect! These are really interesting flavour combinations... They look fantastic! Well done! What a perfect spring dessert, thanks for posting I can't wait to try it out! Beautiful colors and love the flavor profile.